Rep. Andy Barr, R-Ky., speaks to his supporters at his victory celebration in Lexington. 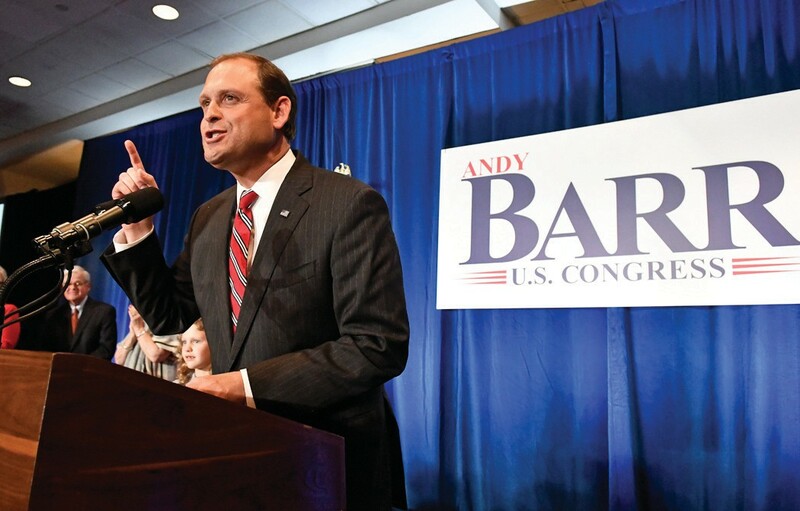 Republican U.S. Rep. Andy Barr won a fourth term in Kentucky’s 6th Congressional District, defeating Democrat and former Marine fighter pilot Amy McGrath on Tuesday in a district that President Donald Trump won by double digits in 2016. McGrath was considered Barr’s toughest challenger since he arrived in Congress in 2012. In his victory speech in Lexington, Barr agreed. Incumbents also won in Kentucky’s five other congressional districts, all Republican except for the Louisville-area 3rd District, where Democrat John Yarmuth was first elected in 2006. Both parties saw the race in the 6th District, which includes Lexington and state capital Frankfort, as close. Barr hosted a rally with President Donald Trump, and McGrath campaigned at a high school gym with former Vice President Joe Biden. Barr throughout the campaign labeled McGrath as “too liberal” for Kentucky. Olivia Renfro, a Centre College student, hugged McGrath and cried after her concession. “I’m feeling pretty devastated, I really believed in her campaign. I really thought she would pull out a win,” said Renfro, who canvassed for McGrath during the campaign. But Renfro said she was inspired as a woman to run for office someday. Barr leaned heavily on the district’s rural counties, winning Madison County, Lexington’s neighbor, with 59 percent of the vote. President Donald Trump came to campaign for Barr in Madison County’s largest city, Richmond, in mid- October. McGrath had hoped to flip a congressional district that has switched party control five times since 1978. But some voters said they liked the way things were going and stuck with Barr. Mike Bickers liked where Barr stood on taxes and immigration issues. He said he was also turned off by the Brett Kavanaugh hearings during his Supreme Court nomination process. “I just didn’t like the way the Democrats treated that man,” said Bickers, a 65-year-old retiree. McGrath raised nearly twice as much money as Barr, using it to build a get-out-the-vote operation with field offices in all the district’s 19 counties. Barr focused heavily on negative TV ads and large rallies featuring Trump and his allies. On Monday, Barr campaigned with Donald Trump Jr. in Mount Sterling. Yarmuth, a former newspaper publisher, defeated two challengers Tuesday — Republican Vickie Yates Glisson and Libertarian Gregory Boles. Yarmuth faced his most serious challenge from Glisson, who formerly served as Kentucky’s top-ranking health official in Republican Gov. Matt Bevin’s administration. During her tenure, Glisson led the state’s effort to impose work requirements on Medicaid recipients. Yarmuth has said he is in line to become House Budget Committee chairman if Democrats take control of a majority of seats in the House. Republican U.S. Rep. Thomas Massie won another term in the 4th District. The former Lewis County judge-executive defeated Democrat Seth Hall on Tuesday in the solidly Republican District in northern Kentucky. Massie, a deficit hawk who often calls for government spending cuts, was first elected to Congress in 2012. Massie has been critical of Democrats and Republicans for what he considers excessive spending. The conservative lawmaker has also been at the forefront of efforts to revive industrial hemp production in Kentucky. Republican U.S. Rep. Brett Guthrie won a seventh term in Kentucky’s 2nd District. The former state senator from Bowling Green defeated Democrat Hank Linderman. Guthrie was first elected in 2008, when Republican U.S. Rep. Ron Lewis chose to retire minutes before the deadline to file for reelection. Guthrie has easily won re-election since then in the southwest Kentucky district. Republican James Comer, a former state agriculture commissioner, defeated Democrat and college professor Paul Walker to win his second full term in Kentucky’s 1st District. Comer, who comes from a farming family, introduced legislation last year supporting the growing of industrial hemp. In 2015, Comer was a front-runner for the Republican nomination for governor, but he lost to Matt Bevin by 83 votes. Bevin would go on to win the general election. Comer served a partial term in 2016 after Republican Ed Whitfield left his seat early. Republican U.S. Rep. Hal Rogers won a 20th term in the 5th District, easily defeating Democratic challenger Kenneth Stepp. Stepp is an attorney who has run against Rogers before. Rogers lives in Somerset. He was first elected in 1981 and is the longest-serving Republican ever elected to federal office in Kentucky. He is the former chairman of the House Appropriations Committee.